As evening sets in, the colourful ribbon canopy really comes alive. 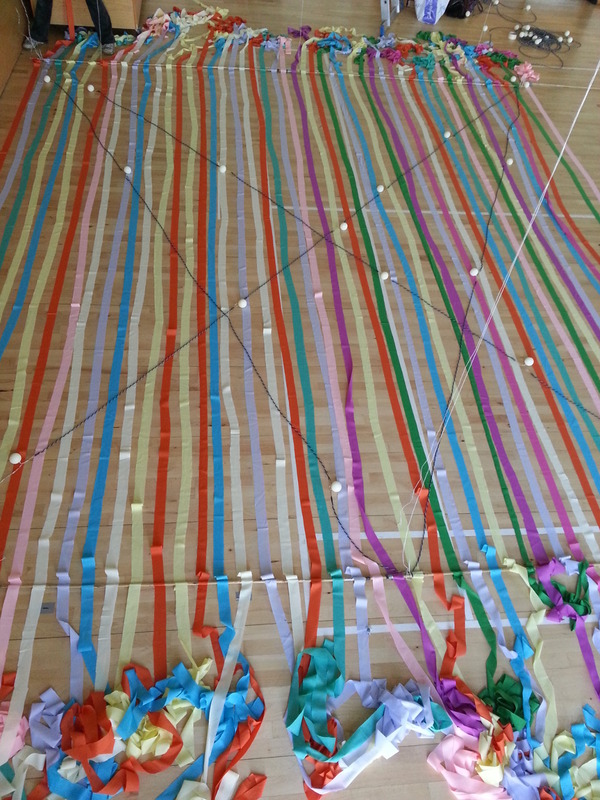 Ribbon of vibrant colours, with pockets of warm white light emanating from from glowing globes. 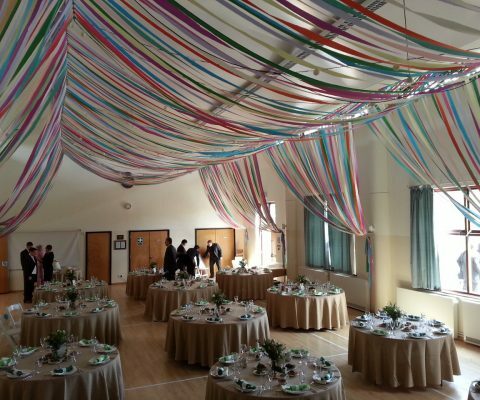 The ribbon canopy was conceptualised as a way to transform a plain village hall into a beautiful wedding venue. Bamboo canes, perfect for their light-weight strength, are suspended from cord fixed to the building structure. Ribbon is cut to length and laid across the bamboo canes. Tape is used to create friction, preventing the ribbon from slipping. Warm white globe lights are interwoven across the layers of ribbon, completing the ribbon canopy. 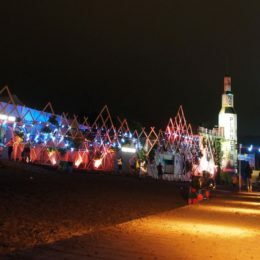 The bamboo canes, complete with colourful ribbon and warm white globe lights are raised into the air. The canopy is suspended a few metres underneath the hall ceiling to create a more intimate environment. 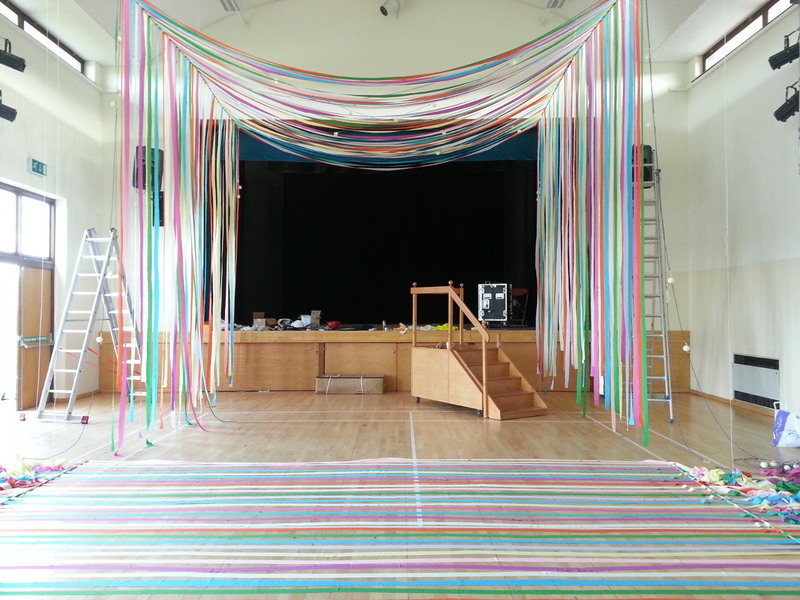 The remaining ribbon is tied off to the walls in bunches, completing the colourful ribbon canopy. 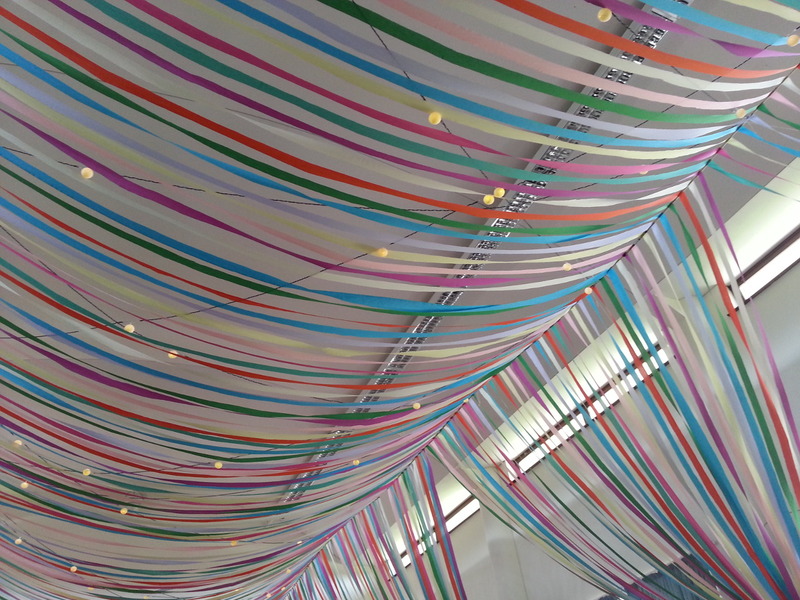 The ribbon canopy creates a more intimate environment, it is suspended a few metres beneath the hall ceiling. 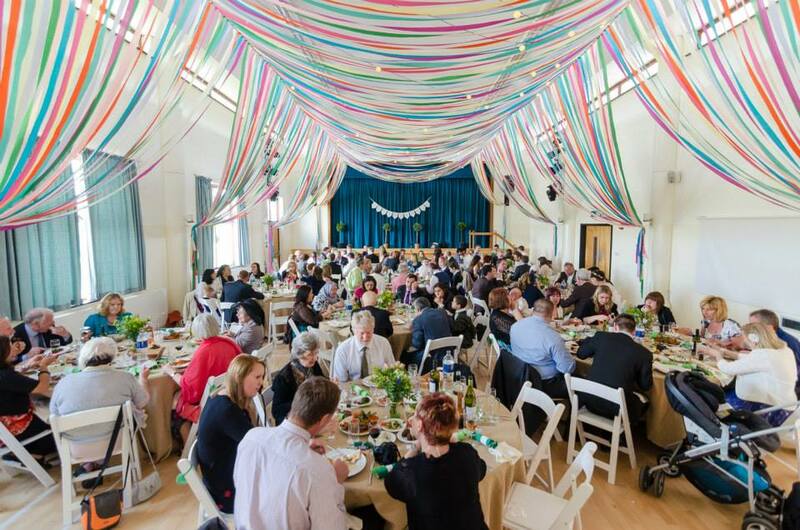 Guests enjoy the wedding breakfast beneath the ribbon canopy. Late into the evening as guests are packing the dance floor, the lights are dimmed. 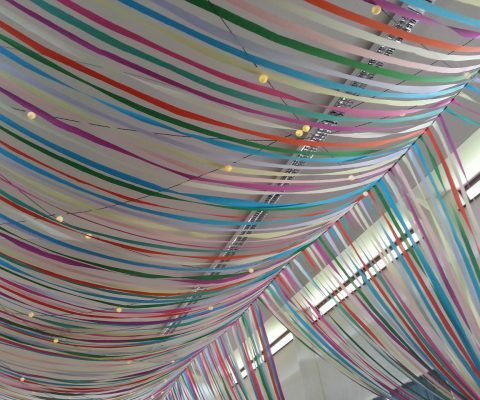 Since we created this Ribbon Canopy Roof back in 2013 we’ve stopped offering complete installations to the wedding industry and now focus on immersive events. 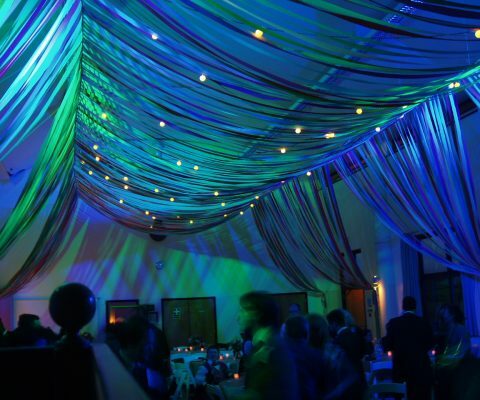 However we do still hire festoon and fairy lights, which we find have been very popular with people who are arranging weddings and receptions. You can find the dry hire section of the website here. We’ve lit wedding receptions at mansions, medieval castles and manor houses – actually not yet a castle, but we’re always keen! – but a town or village hall poses a particular problem. How do you take a largely plain and open function room and turn it into a more intimate and inviting space? 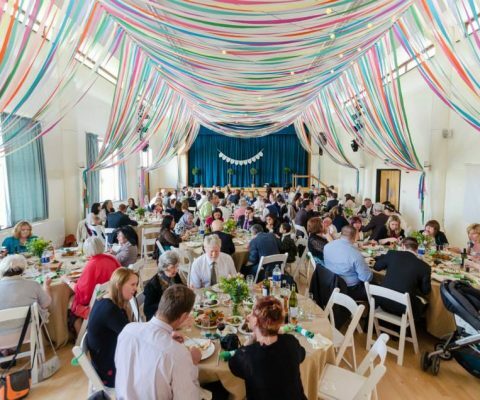 While some event companies might tempt you with an indoor tent or truss and all manner of ugly props from the corporate world, we prefer a more minimalist approach to indulge your guests. May I present to you: the colourful ribbon canopy wedding! 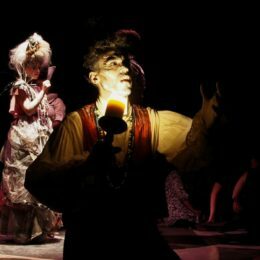 Although this goes beyond the realm of lighting, working in events has taught us how to adapt our skills to achieve the same results, namely to influence the mood and experience of the crowd. 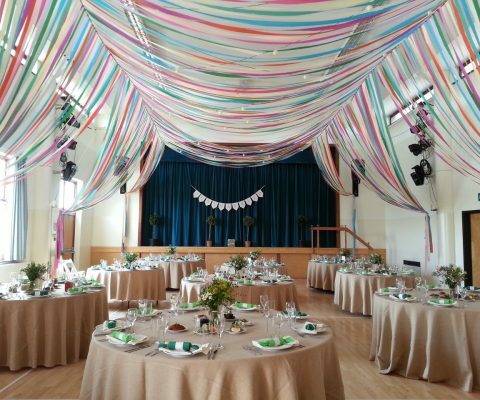 For this particular wedding, we were approached for advice on how to transform a bare venue into a beautiful space for the wedding party and their guests to enjoy. 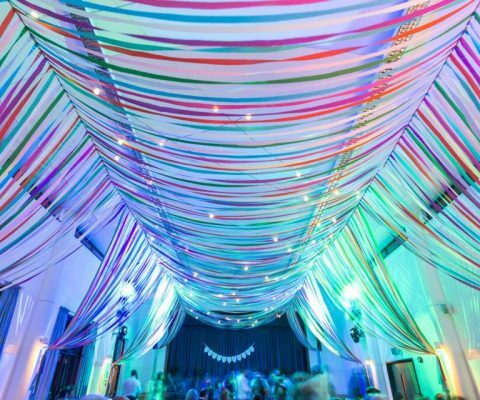 They wished to inject vibrant colour and warmth into the reception venue, and had a limited budget for how to achieve this. 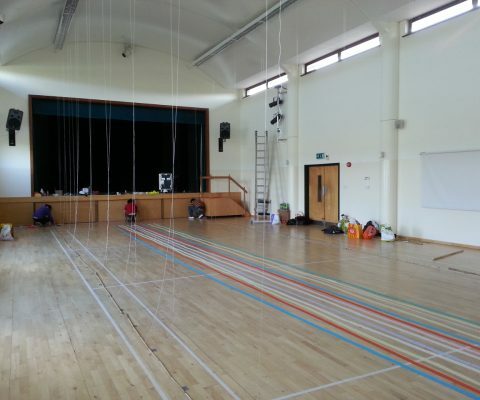 We also had limits on how we could use the village hall, such as not fixing anything to the walls or ceiling since it had recently been redecorated. 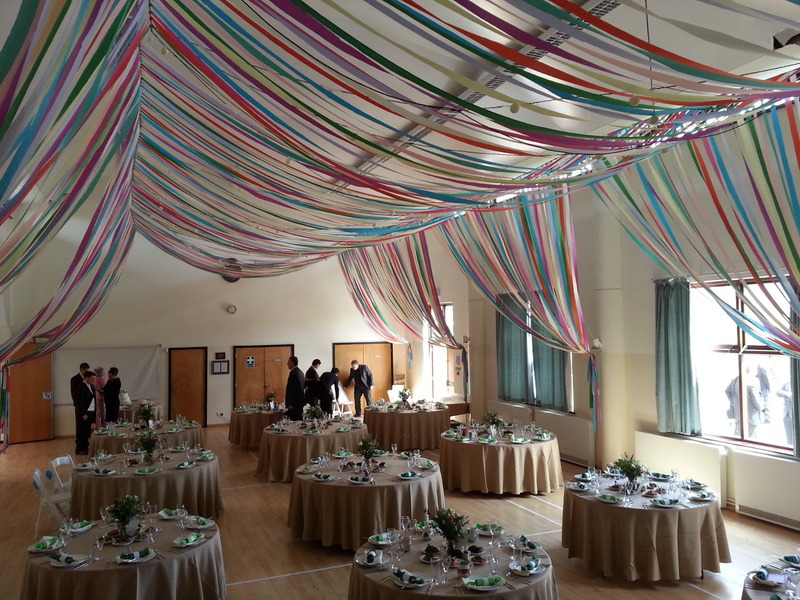 Our solution was to create a colourful ribbon canopy complete with warm white globe lighting. Given the size of the hall, a self supporting system would have involved installing a lot of bulky and unattractive infrastructure. Instead, to create the ribbon canopy we devised an ultra-lightweight system that could be rigged from the existing building supports. A few calculations later we knew what materials were required. 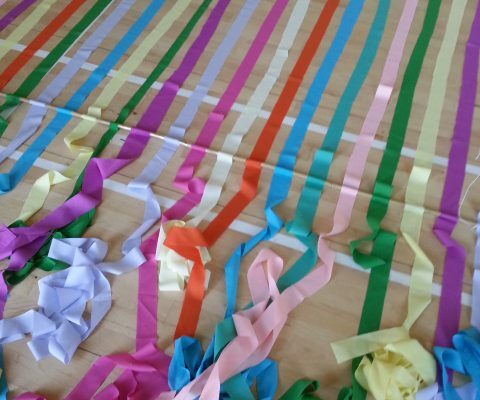 The soon to be married couple chose to source their own ribbon, which was in fact created by slicing up large sheets of material into thick lengths. 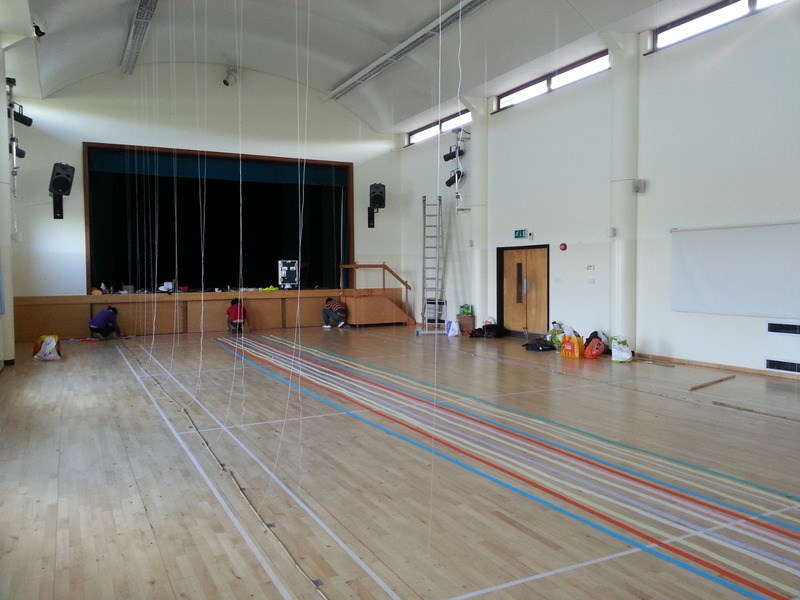 We attached lightweight bamboo canes to cord and created two channels running parallel down the full length of the hall. 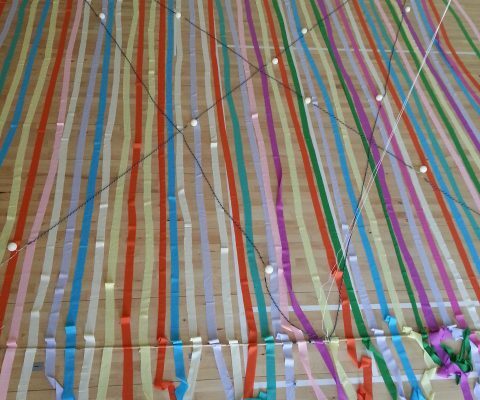 On top of this we sat the colourful lengths of ribbon and fixed three lines of warm white globe lights, which we had previously modified to the required lengths, to zigzag between each channel above the ribbon. 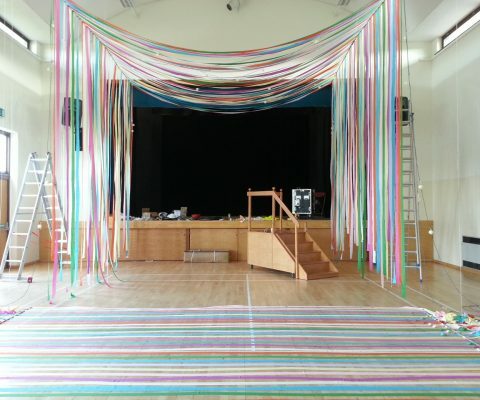 With the help of a number of excited volunteers, we raised it into the air in stages and secured it a few metres below the ceiling of the hall. 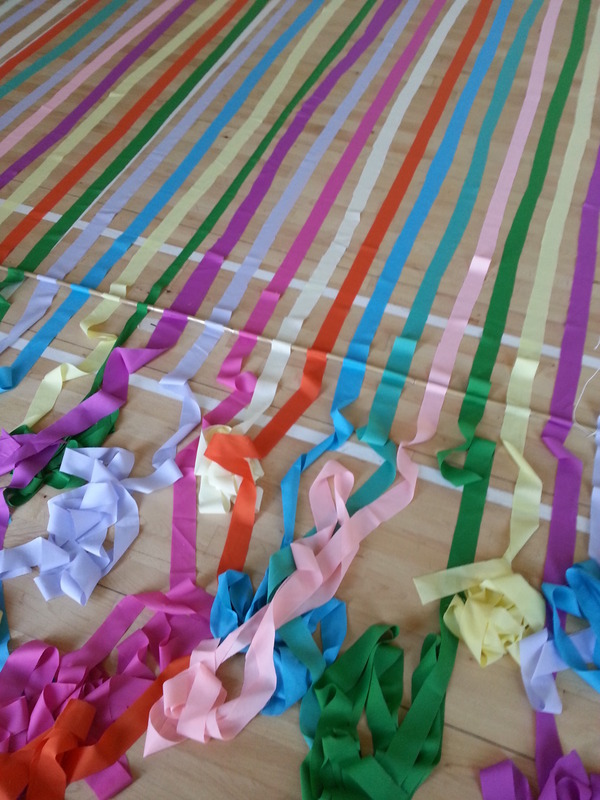 To finish, we tied off the trailing ribbon in bunches at the sides. 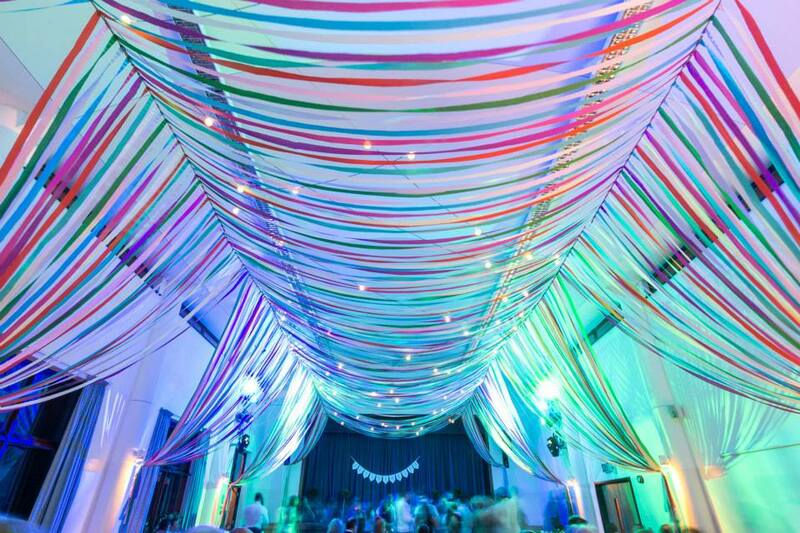 As an extra bonus we rigged a few LED parcans on to lighting bars and focused them towards the ceiling, projecting extra colour on to the ribbon during the first dance and into the evening. 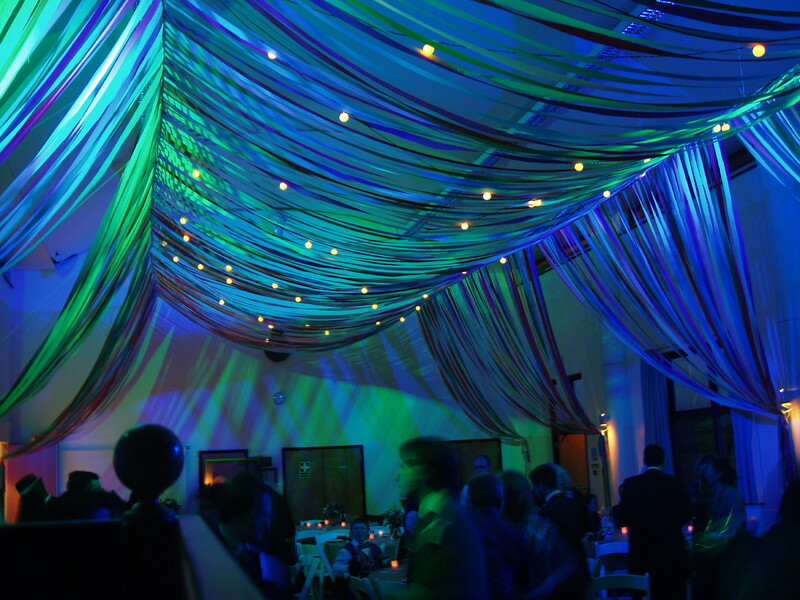 The most interesting projects are always a challenge, so designing and lighting a ribbon canopy for a wedding reception was a request we all got very excited about.